According to the DHS, those who espouse individual liberty and limited government are radical potential terrorists. It seems that the founding principles of this country are considered seditious to those presently in power. Of course by this logic the Declaration of Independence is anti-American and treasonous. It also puts the majority of Americans in the category of potential terrorists. According to Janet Napolitano it seems The Tea Party folks need to watched by big sis for their rebellious ideas. The same people that conducted hundreds of rally’s that involved hundreds of thousands of people with nary an arrest; people that often left the areas they were protesting in cleaner then they found them are the dangerous ones. In fact she seems to look at them with as much or more suspicion than Islamic groups preaching violence or the anarchists driven occupy movement. It would all be funny but for the fact DHS is an organization with real power. An organization that is even now spending millions on drones to fly over American homes and spying on everyday activities. That wants to expand the TSA to act as a police force over America’s highways. As an organization DHS seems to be an agency without boundaries. Without trying to be melodramatic, it seems that as the 21st century moves into its second decade American society seems to be slipping towards the world found in the novel 1984. It may well be that George Orwell ‘s prophetic book was merely off by three decades or so. As the United States celebrates is 236th birthday it might be a good time for all Americans to look back at why this country was founded. The American Revolution was not a revolution in the conventional sense. Unlike most other so called revolutions the fight for independence was not a fight for radical change. The fact is they fought not to change their way of life but to maintain it. It is also worthy to remember this and to look back on this day and re-read the Declaration of Independence. The revolutionary part of the American Revolution did not happen until thirteen years later when the Constitution of the United States was put into effect. It was the result of some of the leading thinkers of the day seeking a government that would protect the apparently radical ideas of limited government and individual liberty. The result of the work led by Washington and hammered out by representatives from the states was revolutionary in form and objective. It seems the present leadership does not understand this nor does it appreciate those that do. The second most read article on this site is the page on the American and French Revolutions, once more it is as widely read outside the U.S. as inside. What American patriots fought for all those years ago are ideas that spill across the boundaries of time and countries. Freedom is seditious only to tyrants and those who aspire for absolute power. Liberty from government control is an American birthright opposed by those who think government should be the final arbiter of all things both public and private. The ideas put forth by the founding fathers may seem subversive to those that oppose such radical ideas as personal responsibility, freedom to choose your own path and limited government but they are part of what it means to be American. Finally it must be remembered that political change done through political means was the goal of the founding generation. This first greatest generation had its radicals pushing for independence from the start but by far the greatest majority fought for a political resolution. Benjamin Franklin was one of the last to give up the fight to remain English and only did so when after his diplomatic mission to prevent war was met with scorn. As it says in the Declaration itself “In every stage of these Oppressions We have Petitioned for Redress in the most humble terms: Our repeated Petitions have been answered only by repeated injury.” The founders were for the most part conservative men who sought change via conservative means. Unfortunately, the only price they would not pay for peace was the only price King George III would accept. Today those seeking preservation of what this country holds dear and standing against those that seek another path are not revolutionaries nor do they seek violence. Like the founders before, violence is abhorrent and its advocates to be shunned. The Tea Party is not Occupy. The war they fight is a political and philosophical one against those for whom freedom, liberty and individual rights are antiquated ideas. It is a war fought at the ballot box and in the halls of congress and in the media, both alternative and main stream. It is fast becoming America’s second War of Independence, a war that like the first is waged to maintain independence and individual liberty. Excellent points about DHS. I would agree about the unique nature of the American Revolution, with one very important caveat. 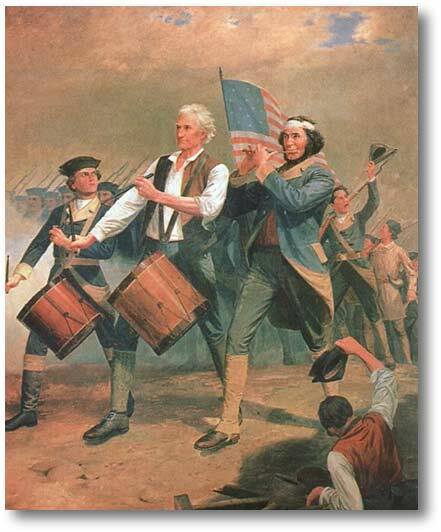 The founders were radicals philosophically and in the course of human history those ideas remain radical even today. For instance, the idea that government exist to serve the people and is subservient to the people is Extremely Radical. The idea that man has a right to pursuit of (his own) Happiness is Extreme Radical. These ideas are not found in any other country – the closest would be other common law countries. These ideas are anathema to the Obama Administration and quite frankly to most people on both sides of the political aisle. These ideas are not found in any religion – including Christianity. These ideas are the unique result of the application of reason to man’s nature. Because they are consistent with man’s nature, the US became one of the wealthiest and happiest nations ever to be visited upon man. Unfortunately, it is on the brink of disappearing. Unfortunately you are right about the present administration and the fact that the ideas of the founders are foreign to many of all political persuasions. The Democrats on average I would consider substantially further from the ideal than the Republicans but that in some cases is not saying much. As far as radicalism, I can understand your thoughts but I have a slightly different take. I would say that most of what they were saying was in line with the Whigs in parliament, especially Burke. Truth is England was the freest nation on earth at the time. It was Burke who first started coagulating the thoughts of natural rights and common law into what he and his followers would call English conservatism; the foundation of American conservatism. It can be argued that the founders took Whigism another step, further developing the ideas of freedom under the duress of a King that was trying to do abroad what he could not do at home. Although the ideas of the founding fathers would of been considered seditious in most of the world they would of been at home among Pitt (the namesake of Pittsburgh and the man pictured collapsing on this sites header, he collapsed and later died defending the colonist in parliament) and Burke who were arguing for the colonists rights in the halls of parliament. I would say from Burke to Madison and Adams is short but worthy step in annuals of freedom. Both sides of the Atlantic held similar views on democracy, individual rights, and the primary purpose of government. One area they differed dramatically was on the usefulness of artificial aristocracies, Both held natural aristocracies were self-evident but the founders saw no need for inherited power whereas most Whigs thought a properly restrained monarchy had its uses. Nonetheless I would consider them in line with English ideas of freedom in the finest old Whig tradition. Ordered liberty was the foundation of their common philosophies. A foundation born of reason tempered by experience and tradition. In my mind the true radicals are those found prancing around the streets of Paris during the French Revolution. Driven by reason untempered by experience or tradition they sought what never was. The colonists it should be mentioned had themselves gone through a personal revolution before the war that is often ignored. A unusually literate populous had become well aquinted with Locke and gobbled up the words of Burke. Just as importatn there had been a religious revolution lead by George Whitfield. The Great Awakening as it was called laid the foundations of religious liberty that was so much part of American thought. This awakeining of mind and spirit is the basis of John Adams’ later reflection “But what do we mean by the American Revolution? Do we mean the American war? The Revolution was effected before the war commenced. The Revolution was in the minds and heart of the people; a change in their religious sentiments, of their duties and obligations … This radical change in the principles, opinions, sentiments, and affections of the people was the real American Revolution.” It is quite unlikely the armed revolution could of happened if not for the revolution of the soul that had happened prior.